Flying Merkel was a motorcycle brand name from the teens, but they also sold a few bicycles. 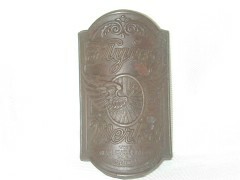 This is the head badge from one of their bicycles. The bicycles were made for them by the Miami Cycle Company of Middletown, Ohio. Flying Merkel bicycle badge showing the winged wheel.